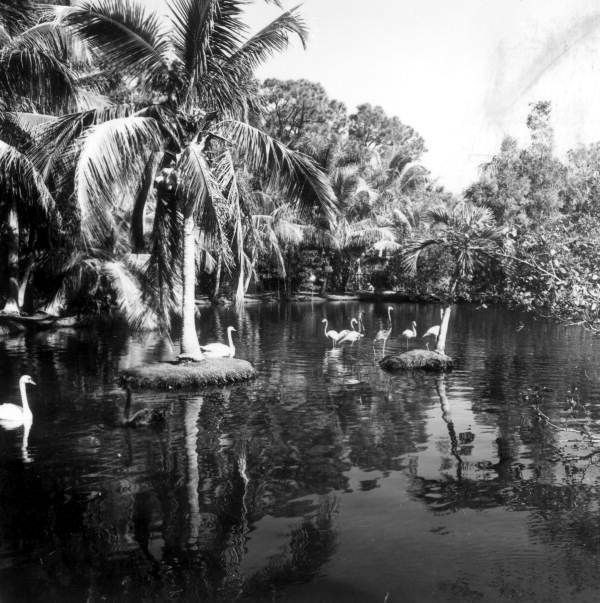 During a vacation in 1967, the Tetzlaffs discovered Caribbean Gardens in Naples and dreamed of this subtropical jungle as a home for their animals. Unfortunately, owner Julius Fleischmann was not interested in selling. 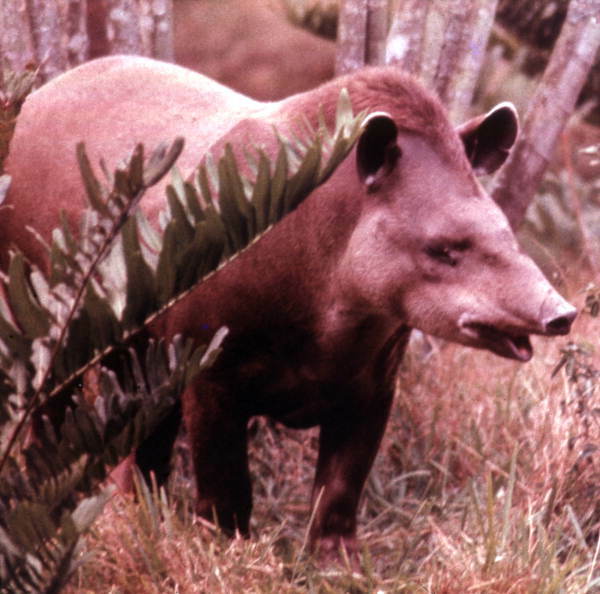 The Tetzlaffs did not forget Naples, however, and, shortly after Fleischmann's death, the Tetzlaffs were contacted to see if they would exhibit their animals within the Gardens. They readily agreed. Surveying the grounds, however, the Tetzlaffs then faced the challenge of carefully placing the exhibits around decades old exotic plants and trees. The magnificence of beautiful animals in such a garden proved well worth all the effort. With a landscape architect who understood their vision, all the original exhibits were created with the removal of only a single pine tree. On September 1, 1969, a wide range of the world's animals greeted the Gardens' guests for the first time. 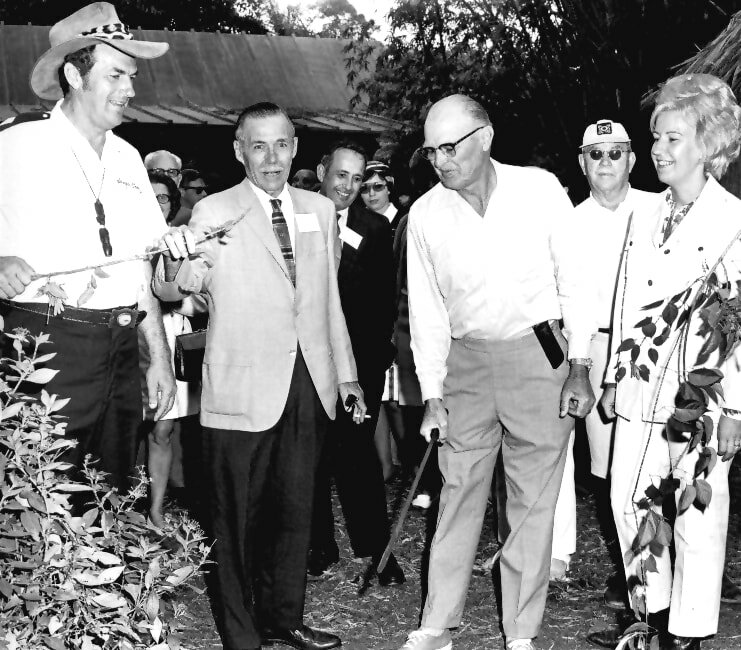 Larry and Nancy oversee the official "vine-cutting" ceremony to open the safari. 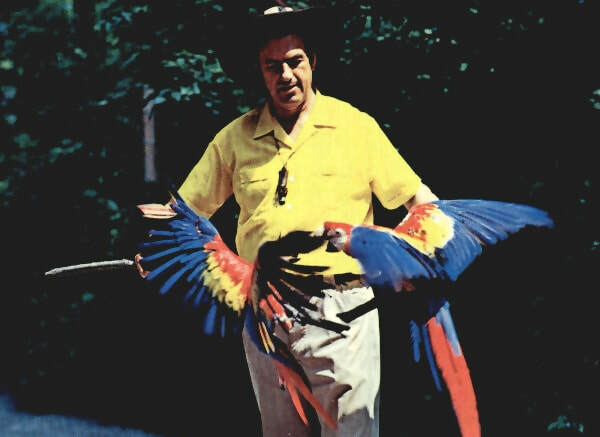 Larry's original harmony acts were the inspiration for Roy Wells to foster the trust of a lion, chimpanzee, and elephant to work together in Naples. The tranquillity of the gardens inspired many successful breeding programs for some of the earth's most beautiful animals. Larry and Nancy and a growing number of staff presented wildlife shows and offered guided tram tours through the gardens and its wildlife. But Larry's personality still held sway. On days when the trams were overflowing, Larry would lead a walking tour and people would give up their seats to go on a walking safari with him. 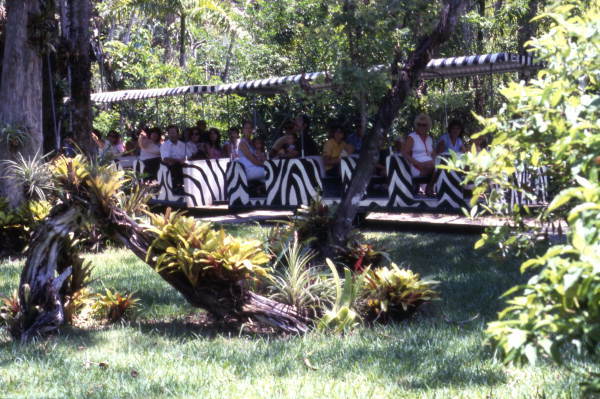 One of the zebra-striped trams passes through the historic gardens. Far too young, Larry Tetzlaff passed away in 1984. 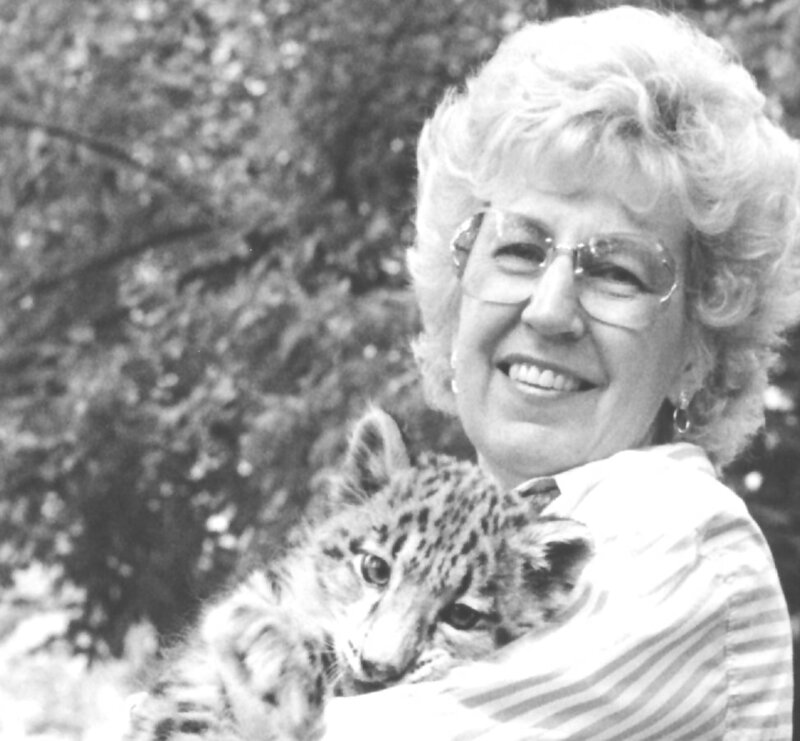 Nancy Jane Tetzlaff, their sons, and staff continued and expanded on the vision of her late husband. 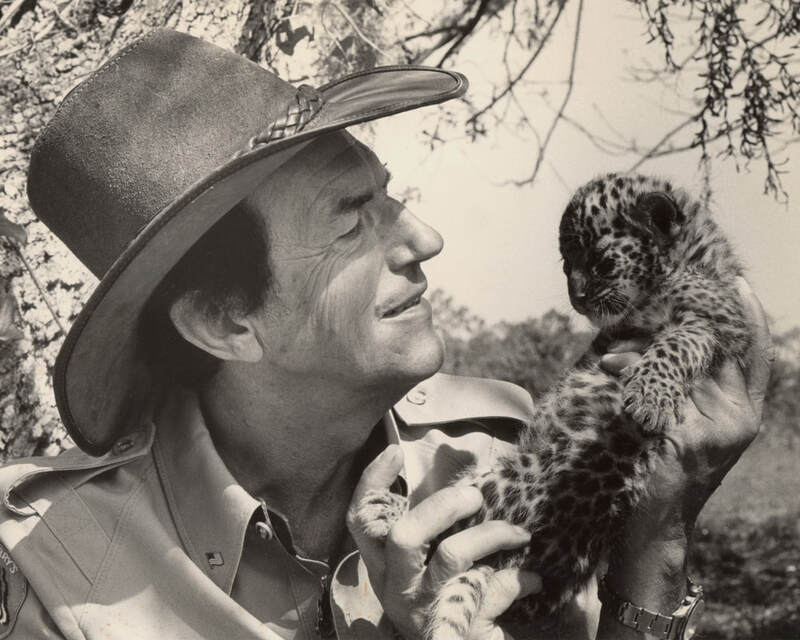 Zoo director Jack Hanna commented, "When you think of Jungle Larry, you think of a man and his family who literally dedicated their lives to exotic creatures of the earth." Using all their parents taught them, sons David and Tim then led the zoo through the arduous task of achieving accreditation by the Association of Zoos and Aquariums (AZA), the international organization that sets the highest standards for animal welfare, safety, research, conservation, and education. Accreditation was first earned in 2001 and in all subsequent inspections. 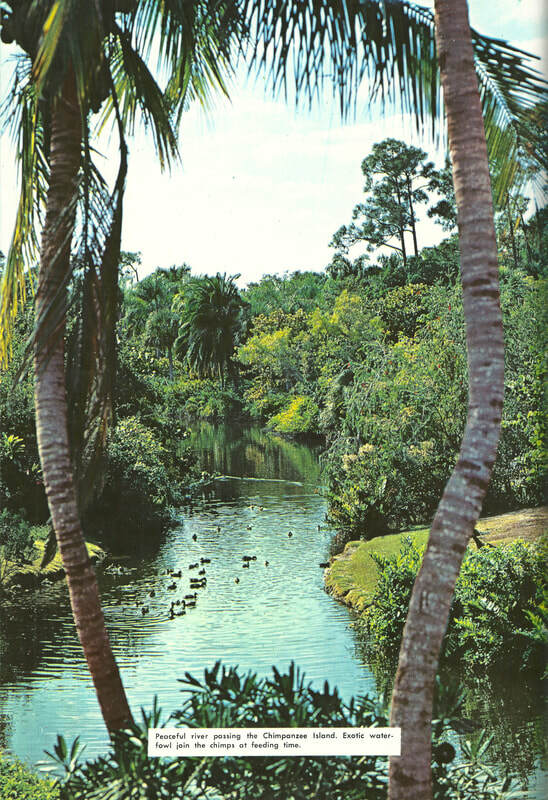 During this time, their Florida zoo flourished and became known as Naples Zoo at Caribbean Gardens. Under the Tetzlaffs, the institution also became a nonprofit 501(c)(3) charitable organization. In 2005, the Tetzlaffs handed over governing authority to the Naples Zoo Board of Directors, who chose to retain the Tetzlaffs in their respective roles. In 2006, Nancy Jane officially retired. In 2012, David made the difficult but rewarding choice to take on a new leadership roles at other zoological facilities. Carrying on the tradition on site, Tim continues to serve as Naples Zoo's Director of Conservation. Expanding on its long history, Naples Zoo supports regional and international conservation field projects and participates in Species Survival Plans® for some of the world’s rarest animals – fulfilling the the dreams of a young boy from Michigan who loved animals and who taught millions of others to do the same. We hope you've enjoyed learning a little more about this wild family and look forward to reading your favorite memories and seeing your photos. 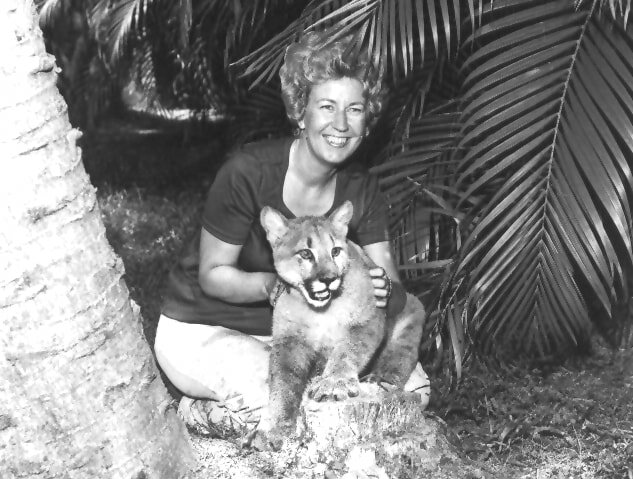 Safari Jane with a young cougar in Naples. 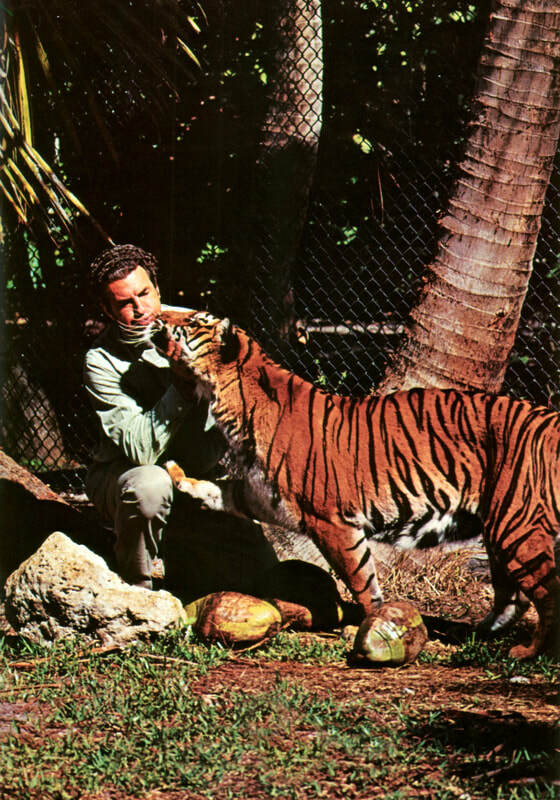 Larry with a tiger in the Naples garden. A view down one of the channels of Lake Victoria in the Naples garden. 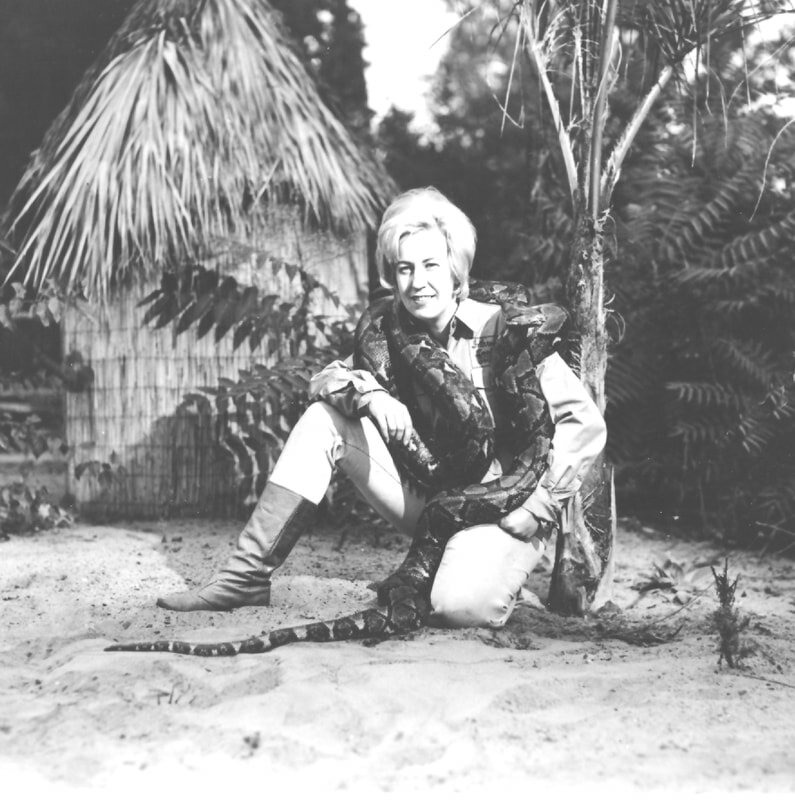 Nancy and a reticulated python. 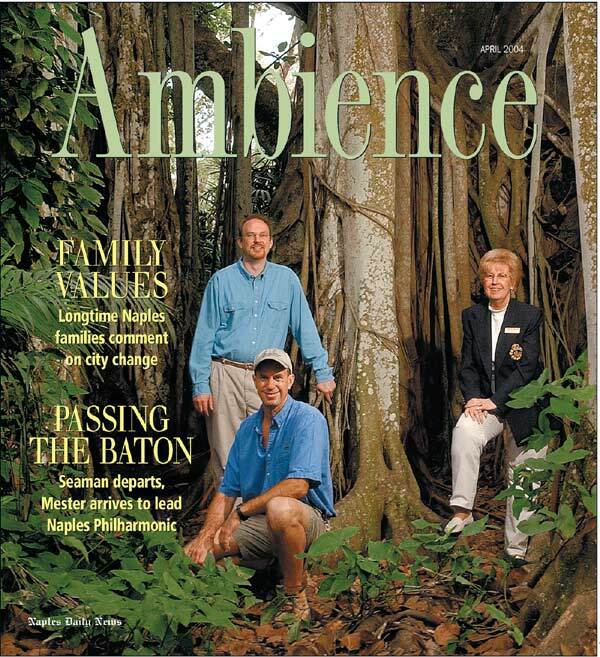 Tim (standing) and David with their mother Nancy on the cover of a local magazine.